This product has already been added to your travel book! By bringing the producer closer to the consumer, the elected officials of the Country wish to develop the primary sectors of the territory and their productions in order to encourage local, quality and seasonal food. The Pays d'Auray is fortunate to have a good diversity of products from the land and the sea. However, places of sale are often unknown to the local population, which is increasingly in demand for quality and proximity. They are also poorly valued among tourists, fond of culinary experiences. 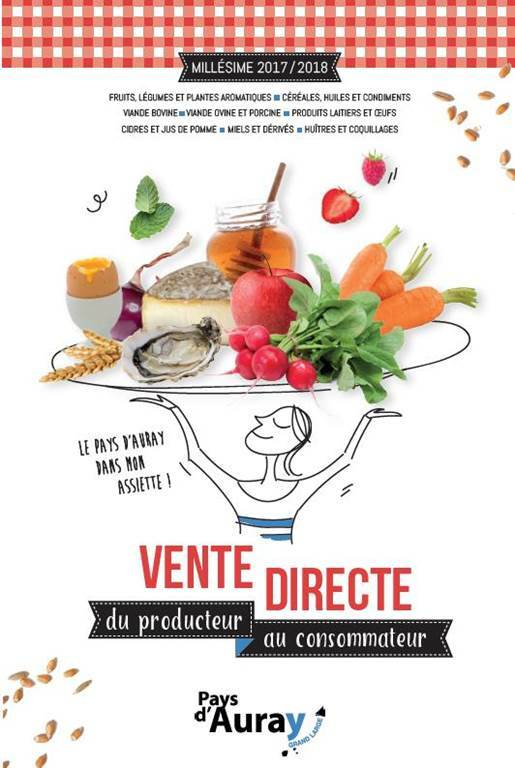 As part of the program "Eating well in Pays d'Auray", the elected officials of the Country have set themselves the task of making known the various producers who practice direct sales on the territory. This guide, aimed at the local and tourist population, meets the expectations of consumers, asking for local products. It allows them to learn about the origin and the quality of the products but also to go to the points of sale on the farm / oyster farm, the specialized stores, the markets and the AMAP. Oysters, Fruits & Vegetables, Dairy Products &meat, cider, apple juice, honey, etc., all local products are listed . The map of the territory, in the interior pages of the guide, allows to visualize at a glance the geographical location of the producers, from Camors to Belle-Ile, from Etel to Pluneret, from Landévant to Locmariaquer.